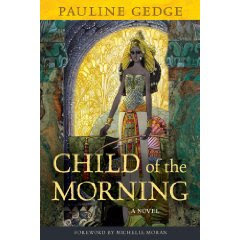 Yesterday I was perusing Pauline Gedge's Egyptian novels at Amazon when I discovered something totally cool. You see, Gedge has authored the only traditionally published, adult novel on Hatshepsut (there's a couple children's books out there). 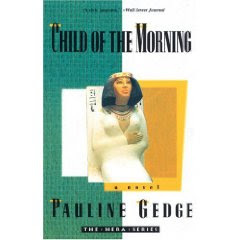 Child of the Morning was originally published in 1977, but my copy is from SoHo Press's release in 1993- it's been hard to find for a while now. This cover will grab someone like me simply because I'll pick up anything that looks remotely Egyptian. But I think for a non-Egyptian fanatic it might be a little dry. Well, yesterday I saw a new cover. It appears that Chicago Review Press will be re-releasing Child of the Morning in April. Snazzy cover, eh? I'm actually a little jealous- I love this one and I was surprised to find that this is the original 1977 cover. I'm thrilled for Gedge (and Hatshepsut, not that she'll know it) that this is coming out again. Although I will admit that my initial response was more along the lines of, "Oh no! How many Hatshepsut books can the market hold?" Yeah, I might have panicked a little. But then my wonderful husband pointed out that Hatshepsut isn't really a household name. A re-release of a book about her will probably whet people's appetites to learn more about her. After all, if the market can sustain the glut of books on Henry VIII, surely there's room for a couple novels on Hat, right? So, if you can't wait for my novel, I highly recommend you check this one out. I've read it a couple times- it's pretty good! What do you think? How many books on the same subject can the market bear? And how much do book covers matter to you if the book is in your favorite genre?